This delicious soup, like Tom Yum, is made with the same ingredients but lightly sweetened up with coconut milk. Simple yet appetizing, our wontons are made with ground pork and shrimp that are then brought to a boil in our homemade chicken broth with napa cabbage. A good‏ complement to any meal, this light chicken broth soup is prepared with mixed vegetables and soft tofu. Yellow chicken curry made with potatoes and carrots served with grilled roti bread for dipping. A generous‏ helping of crispy fried tofu served with sweet and sour dipping sauce and crushed peanuts. Spicy chicken salad, Larb Gai is made with minced chicken tossed with fresh limejuice, red onion, chili powder, and spring onion, and is topped with fresh mint. Thinly sliced grilled New York sirloin steak tossed with spicy chili lime juice and red onion and topped with fresh mint leaves. 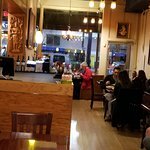 Crispy fried salmon filet with panang curry or spicy Thai basil sauce served with a generous portion of steamed broccoli and white jasmine rice. Grilled slices of New York sirloin steak marinated Thai style topped with sesame seeds served over a bed of steamed mixed vegetables and white jasmine rice. New York sirloin steak marinated Thai style with Thai spicy dipping sauce paired with shrimp sautéed in garlic butter, all served with steamed vegetables and white jasmine rice. Fresh crispy catfish filet stir-fried with red curry paste and kaffir lime leaves, served with green beans, bamboo, eggplant, bell pepper, and white jasmine rice. Fresh crispy Tilapia filet with Thai style chili sauce served with baby corn, carrots, spring onions, onions, tomatoes, broccoli, green beans, red pepper, lettuce, zucchini, and white jasmine rice. 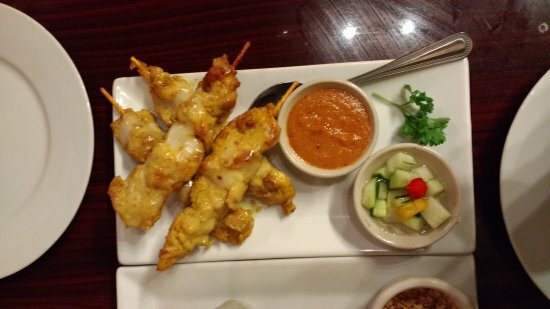 All of our Thai curries are served with white Jasmine rice. A spicy Thai red curry made with red curry paste, bamboo shoots, bell peppers, green beans, and eggplant. A delicious yellow curry cooked with yellow curry powder, potato, and carrots, topped with fried onions. A tasty Thai green curry made with green curry paste, bamboo shoots, bell peppers, green beans, and eggplant. A Thai comfort food, this curry dish is made with your choice of meat simmered in savory curried peanut sauce with coconut milk and aromatic kaffir lime leaves served with a side of steamed broccoli. aka "Jungle Curry," is flavored by lemongrass, galangal, kaffir lime leaves, garlic, young peppercorn, rhizome, and red curry. This wild dish served with your choice of protein will be filled with bamboo shoots, eggplant, and green beans. (seasonal) A delicious sweet and spicy combination, our mango curry is prepared with sweet mango and your choice of meat in red curry and coconut milk, then complimented with bell peppers. 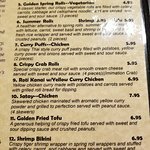 All of our entrees are served with white jasmine rice. This famous spicy chili basil dish is prepared with your choice of meat and is cooked with green beans, bell peppers, onions, and garlic. Your choice of meat stir-fried with fresh ginger, white onion, and spring onion in a light black bean sauce. A flavorful dish, Pad Prik Khing is a spicy Thai string bean dish that is made by cooking string beans and your choice of meat in a special red chili sauce with kaffir lime leaves. Your choice of meat stir-fried in a sweet and tangy sauce with tomatoes, red and green peppers, onion, cucumber, baby corn, mushrooms, and spring onion. White meat chicken stir-fried with cashew nuts, bell peppers, white onion, and spring onion in a brown sauce. 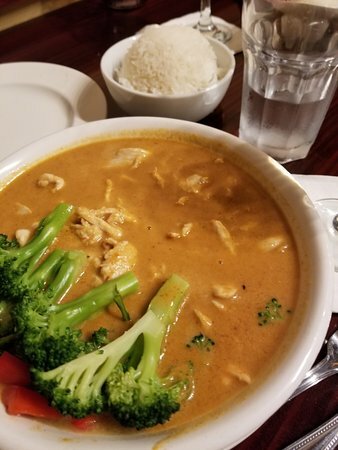 Your choice of meat cooked in a yellow curry peanut sauce and served with steamed broccoli and white jasmine rice. Your choice of meat sautéed with a generous helping of eggplant, green beans, bell peppers, onions, garlic, and basil in a spicy chili soybean sauce. Your choice of meat, bamboo shoots, and bell peppers stir-fried in a spicy basil sauce. Your choice of meat stir-fried in light brown oyster sauce served with steamed broccoli and white jasmine rice. Similar in taste to our wonton soup, this soup is made with our homemade broth and features soft tofu and seasonal vegetables. Spicy shredded julienne green papaya salad with green beans and tomatoes tossed in a spicy chili lime juice dressing topped with peanuts. A favorite Thai dish, this vegetarian stir-fried thin rice noodle dish is made with fried tofu and is served with bean sprouts, a slice of lemon, and ground peanuts on the side. A spicy and flavorful Thai noodle dish, this dish is made with stir-fried, wide, flat rice noodles and fried tofu cooked in a chili garlic sauce with sweet basil leaves, and features bell peppers, tomato, and broccoli. A spicy and flavorful Thai noodle dish, this dish is made with stir-fried, wide, flat rice noodles, a chili garlic sauce, sweet basil leaves, bell peppers, tomato, broccoli, and fried tofu. A generous helping of eggplant sautéed with basil in a spicy chili soybean sauce with green beans, bell peppers, onions, and garlic, served with white jasmine rice. 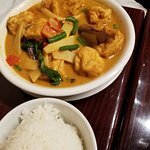 Perfect with‏ white jasmine rice, this dish is cooked with mixed seasonal vegetables and fried tofu in a light brown garlic sauce. This dish can also be made spicy. Fried tofu stir-fried in light brown oyster sauce served with steamed broccoli and white jasmine rice. 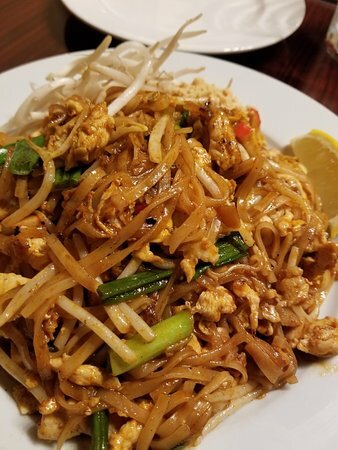 A favorite Thai dish, this stir-fried thin rice noodle dish is made with your choice of meat, egg, and red bean curd, and is served with bean sprouts, a slice of lemon& ground peanuts on the side. This sweeter Thai noodle dish is made by stir-frying rice noodles, egg, and your choice of meat in Thai soy sauce, served with steamed broccoli. A spicy and flavorful Thai noodle dish, this dish is made with stir-fried, wide, flat rice noodles, a chili garlic sauce, sweet basil leaves, bell peppers, tomato, broccoli, and your choice of meat. 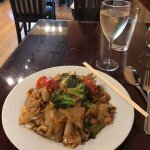 Our spin on traditional Thai drunken noodles, this dish is made by stir-frying lo mein noodles in a chili garlic sauce with sweet basil leaves, bell peppers, tomato, broccoli, and your choice of meat. Spicy Thai style fried rice stir-fried with a chili basil sauce and your choice of meat with peas and carrots. Thai style fried rice with tomatoes, peas, carrots, green onion, white onion, and your choice of meat. Thai style fried rice with pineapple chunks, tomatoes, cashew nuts, onion, spring onion, egg, and your choice of meat. Thai style fried rice with tomatoes, peas, carrots, green onion, white onion, egg, and lump crabmeat. Thai style fried rice with tomatoes, peas, carrots, green onion, white onion, egg. Sweet mangos served with steamed sticky rice drizzled with coconut milk and lightly sprinkled w/crispy yellow beans. 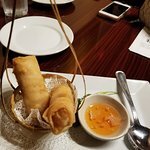 Bananas delicately wrapped in spring roll wrappers, fried to a golden brown, and topped with sweet honey. 这已经成为了我们最喜欢的泰国餐厅在华盛顿地区。 我们从来没有去过泰国很多但味道比其他更高的亮度和强健的泰国餐厅。 开胃菜,木瓜沙拉是我的最爱,手 - 往下走。 它有一个漂亮的辣的后劲它,但对我来说也是很好的香料。 我甚至可以去热。 :）真的是非常美味,蔬菜都嘎吱嘎吱,醋和调料都是非常馅饼的时候我很难过我喝完了它。 其他的开胃菜给我们的那个春卷（好配上脆脆的和一个甜的蘸酱）和一个很酸的冬阴功汤。 主菜,即使我喜欢吃辣的。 我的手 - 这是到目前为止最喜欢的一道菜就是泰式炒河粉eew。 面条很有嚼劲和令人上瘾的和有一个烟雾缭绕的 - 各种烧烤的味道弥漫着这道菜。 我们能拿到有猪肉的。 我不知道这一点很重要。 芒果咖喱的菜也是很独特的,甜的和辣的协同工作。 很棒的丛林咖喱! 我的孩子喜欢小胡椒炖在那里分支。 你可以选择任何你想要使用这些蛋白质 - 我通常是鸡肉或虾。 我不大在泰国/甜糖醋菜因为它看起来对我来说太甜了,但是真的很适合敏感的人的香料。 哦,你可以问他们要调整的更高级别的香料, 1之间（轻度）和5（泰国热）。 不要跳过这里的甜点。 获得糯米芒果椰子,你会很高兴你做了! 米饭是热的顶部与椰子酱,和它的一个菜是最欣慰的! 这里的气氛很随意,服务很随意但友好。 这里的价格很优惠! 有一个停车场（wayne车库）附近和在周末的时候是免费的。 我住90分钟路程,这太糟糕了,不然我每个周末都会来这里!